Amidst the twinkling stars of Austin’s starry moonlight, the city’s trailblazers come out to celebrate visionary Charles Umlauf and to continue his life mission with Austin’s best and brightest. Sam’s Limousine is honored to be a part of the annual UMLAUF Garden Party, offering safe, reliable, and professional transportation solutions for Austin’s finest each and every year. This year, the UMLAUF Sculpture Garden and Museum’s annual soiree returns on Thursday, April 25th for its 21st event at the museum and gallery. Imagine an enchanting backyard garden, its tree branches winking with a soft glow. Inspired sculptures illuminated in the night air, strategically placed throughout a magical estate of imagination and creativity. Stand with awe before incredible pieces created by the Guggenheim-featured artist, also presented in Washington D.C., at the famed Smithsonian. Experience James Surls: With Out, With In for its first public exhibition, debuting in Austin until August 18, 2019. Also on display is the famed fōtän FABLE redux, a new addition to the garden by local artist Jamie Crawley. This exclusive event offers after-hour opportunity to view the museum’s collections from a different and unique perspective. 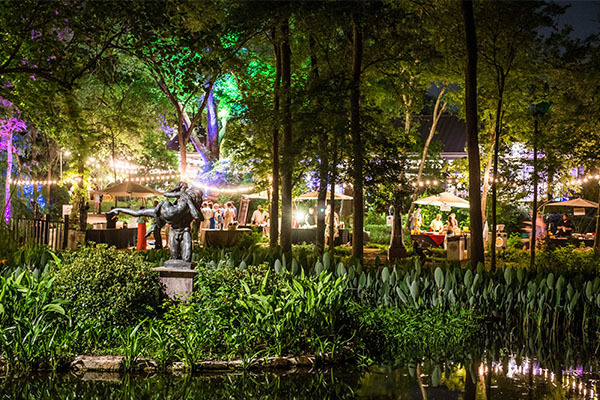 Complemented by canapés and fine wine, UMLAUF celebrates its 21st Garden Party with some of the areas most revered and talented Chefs, who will feature succulent bites to accompany custom wine pairings selected by the connoisseurs at Twin Liquors. Celebrated local chefs from Juliet Italian Kitchen, ELM Restaurant Group, and Moonshine Grill have all joined the event, in addition to familiar names from P.F. Chang’s and Alamo Drafthouse’s The Highball. Bars will be strategically placed along your route of exploration of Umlauf’s finest. Other sponsors include Whim Hospitality, Merick Strategies, Wunderman, Austin Monthly, and KMFA 89.5, but sponsorships aren’t limited to corporate heavyweights. Individual sponsorships are actually welcomed at UMLAUF, and, through the Umlauf Sculpture Sponsorship program, it is possible for these beautiful statues to bear your own name. The Garden Party recognizes program participants each year as well, with included reservations for the VIP lounge. New this year is the addition of musical accompaniments to the garden delights. The event welcomes performances from Sky Candy, Austin Classical Guitar, Panoramic Voices, and Austin Shakespeare. The VIP lounge will feature special performances by Mela Sarajane Dailey and friends. General admission tickets are $175 each, or splurge for the $275 VIP ticket for access to Hudson’s Hill Country’s exclusive VIP lounge. Ask Sam’s Limousine how to save up to 15% off 2019 UMLAUF Garden Party tickets! Doors open for general admission at 7pm, and close again at 9:30 when the event concludes. Located near the famous Zilker Park, parking generally presents a massive issue simply due to the limited space available. Sam’s Limousine stands waiting with an entire fleet of polished and pristine vehicles for you to choose from. For this event, might we recommend a beautiful black Mercedes sedan or perhaps a plush stretch limousine for a red carpet-worthy entrance. Our limousine party buses offer a ton more room for up to 36 passengers, with first-class amenities to include sumptuous leather seating, color light effects, and wooden flooring. And don’t forget, it’s all for a good cause. Proceeds from the event, including its dedicated fundraiser, support the museum’s ongoing growth and maintenance, as well as continued educational programs for the artists of tomorrow. Umlauf believed strongly in education as a professor himself, and it is evident in the museum’s continuing commitment to art and sculpture. The museum boasts more than 50,000 visitors annually. Most notably are the free admission, tours, and support given to Central Texas youth, transforming the museum into a welcome hub of inspiration young inquiring minds through workshops, lectures, and camps. Sam’s Limousine has the honor of partnering for safe and professional transportation every step of the way. We share in this vision today, joining continued efforts to support Texas youth. Your support on this balmy April evening creates all of this and more. 2018 brought in more than $250,000 in donations in just one single night. 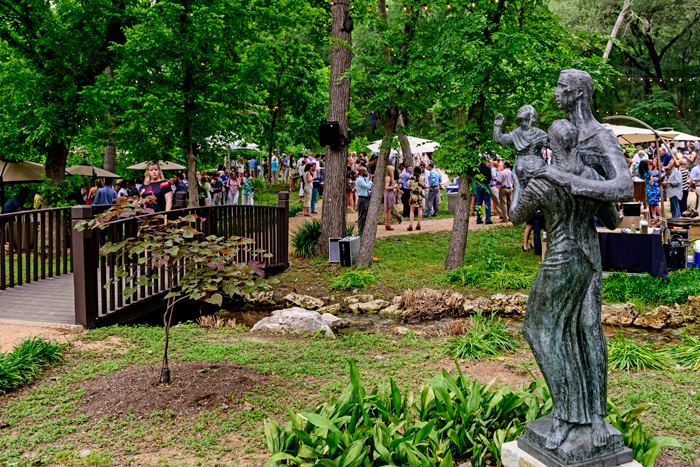 The Umlauf Gallery and Museum continues to attract educational institutes from all over the great state of Texas, and the Umlauf Garden Party is especially important to these efforts. 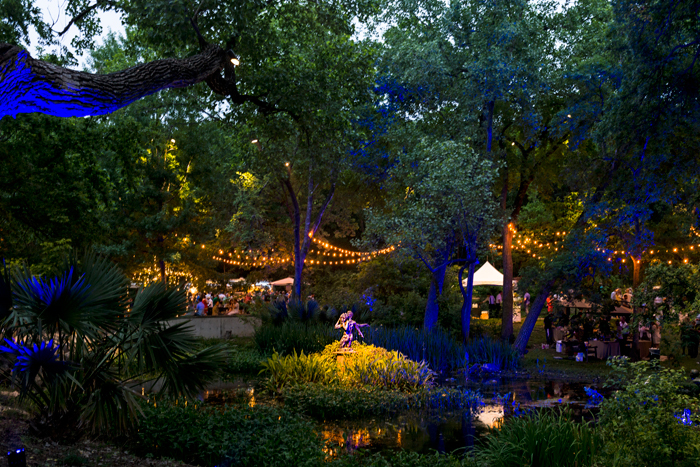 Don’t miss the enchanting intrigue of the 2019 UMLAUF Garden Party. Book your black sedan or SUV limousine for the event today! Availability is limited, but Sam’s Limousine is currently accepting reservations for this remarkable event. And don’t worry – the fun doesn’t end there. UMLAUF also hosts a monthly mixer through their Umlauf After Dark series, so contact us today to plan your social calendar this spring! Sam’s Limousine will be right there with you for the ride.